The IDA's principal partner is the Dubai Future Foundation. An incubator for innovation, the DFF is the perfect collaborator for a technology-led organization like the IDA. We are honored to display the arch in Dubai at the 2017 iteration of the World Government Summit. Sited at the entrance to the Summit, where it will be seen by all who attend, the Triumphal Arch will integrate perfectly with its physical surroundings as well as the spirit of the occasion, embodying as it does both tradition and high technology. The residents of Dubai, and the visionary leaders who conceived of the city, know better than anyone the importance of place and the national pride that can reside in architecture. 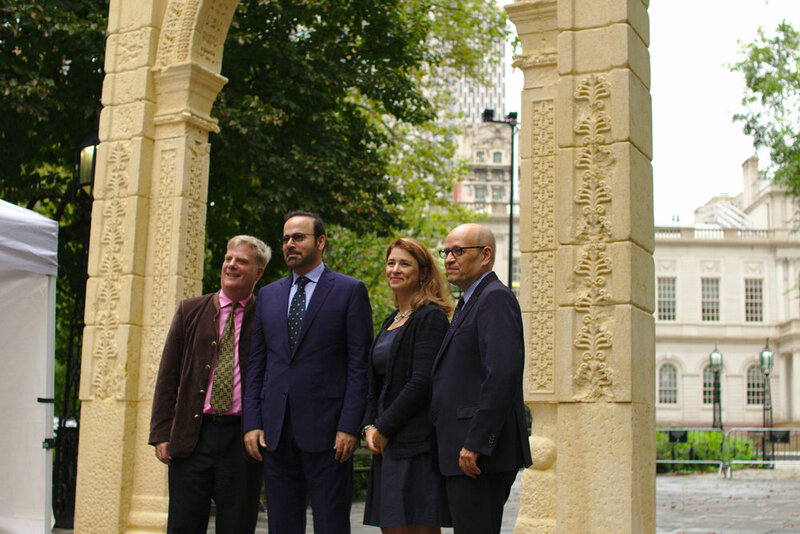 The Triumphal Arch, symbolizing the prosperity, technical prowess and cultural richness of the ancient trading hub of Palmyra, will be right at home in Dubai, a city that reflects all of those same virtues. Sheikh Mohammed bin Rashid Al Maktoum, prime minister of the United Arab Emirates and Emir of Dubai unveiled the IDA's reconstruction of Palmyra's Triumphal Arch at the World Government Summit on Sunday, February 12th in Dubai. On hand to assist with the unveiling were UNESCO Director-General Irina Bokova and IMF President Christine Lagarde, as well as a host of other dignitaries. Below, Roger Michael, the IDA's founder and Executive Director, explains the technical processes underlying the reconstruction of the arch. The Institute for Digital Archaeology is very pleased to announce that it will be launching the Centre for Future Design at the World Government Summit 2017 in Dubai. The Centre for Future Design is the IDA’s flagship initiative for 2017. It will house a research group focused on using applied physics to solve problems in the areas of cultural heritage preservation, protection and documentation. It will also be home to a suite of innovative educational and outreach programs, including a digital archaeology certificate programme, mid-career/executive education programmes and the new University of Oxford FOx initiative (see below). The centre will be housed at Oxford within the department of mathematics, physics and life sciences. The Centre for Future Design will dramatically expand the IDA’s emphasis on scientific research and education as it relates to cultural heritage preservation, technical innovation and future-directed policy planning. One of the highlights of the 2017 World Government Summit for the IDA was the launch of the new Future Opportunity Exchange (FOx), an educational initiative based at Oxford University’s Magdalen College. FOx is an international outreach program that connects students and teachers with resources and technology designed to promote educational and training opportunities in underserved communities around the world. In addition to curriculum development and teacher education, the FOx program also provides services like peer-to-peer tutoring, financial aid counseling and conference support. FOx will use Oxford University’s global network to link participants through a program of interdisciplinary activities focused on the exchange of ideas and the exploration of human culture, citizenship, and shared aspirations for personal growth and stronger communities. The IDA will participate in FOx’s annual programs by assisting in the development of innovative curriculum materials, providing technology resources, and supporting workshops, conferences and information days for a global mix of students and teachers. In addition, FOx will participate directly in the IDA’s planned World Youth Congress scheduled for Dubai in 2018 which will present an unprecedented opportunity for reshaping global approaches to increasing educational opportunities children of all backgrounds.